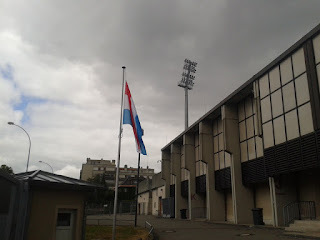 Luxembourg has always been regarded as one of Europe's lesser lights as far as football is concerned; up until the admission of countries such as the Faroe Islands, San Marino, Liechtenstein and Andorra to FIFA and UEFA at the end of the 1980s, the Luxembourg national side was consistently the worst-performing team in World Cup and European Championship qualification. Yet, Luxembourg, represented by the FLF (Fédération Luxembourgeoise du Football, the Luxembourg FA), along with Portugal, are the only two countries which have competed in qualification for every European Championship and World Cup tournament. An attempt to introduce football into the country was made by a certain Henri Baclesse, a businessman residing in Hollerich, a district of Luxembourg City, in 1889. 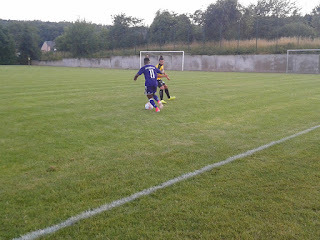 Baclesse, a member of the CGDEL fencing and gymnastics club, had gone to England on a business trip and returned with a football, which he had brought back for the benefit of the club's younger members. After an initial burst of enthusiasm from the youngsters, interest quickly faded and Baclesse's efforts were in vain. 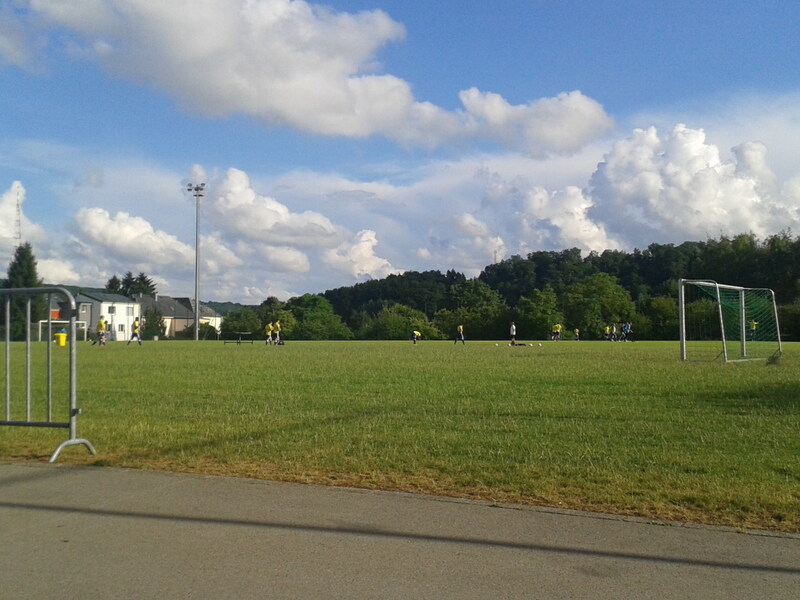 Some years later, at the beginning of the 20th century, football was being played in the streets of Luxembourg's second city, Esch-sur-Alzette, thanks at least in part to an English teacher at the city's technology college. Jean Roeder, a native of the tiny village of Roodt, had gone to England to study the language not long after Baclesse's return, and, after spending over a decade in England, came back home with..a football. The college's students, who were starved of physical exercise, took to the game and its popularity soon became evident on Esch's streets. 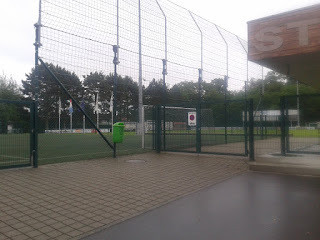 Cercle Sportif Fola Esch - better known as Fola - hold the honour of being the oldest club in the country, having been founded by Roeder in 1906. 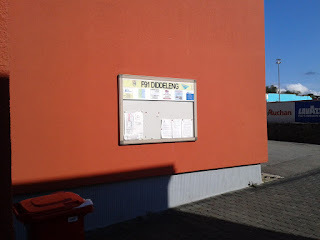 The name Fola represents the club's football and lawn tennis departments which were founded together on 9 December of that year, although the lawn tennis department, together with the handball and athletics departments which were formed later, became sundered from the football side of the club in later years. 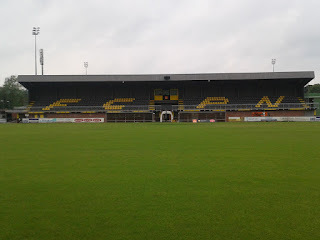 Fola's golden years were between 1917 and 1930, during which time they won the national title five times and were runners-up on four occasions; they also won the country's FA Cup twice. 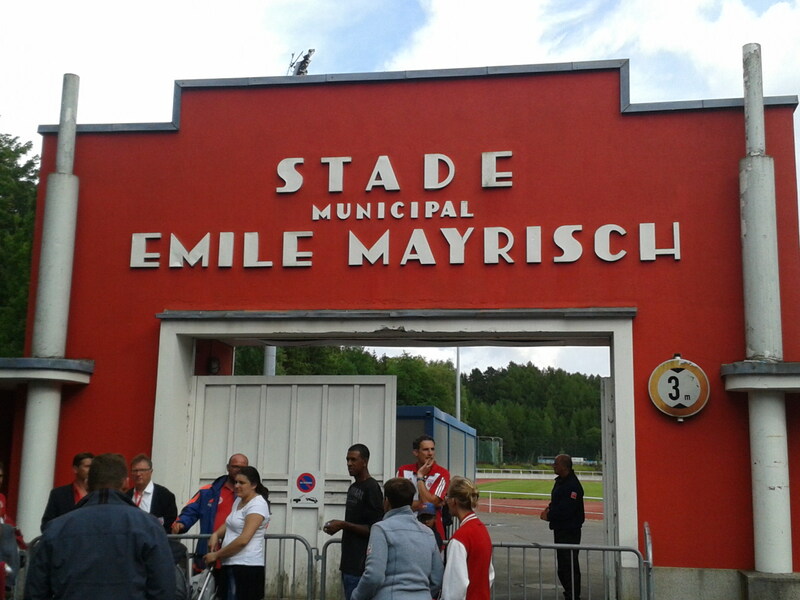 They moved to their current home, the Stade Émile Mayrisch (pictured above) in 1935, and then the trophies dried up. 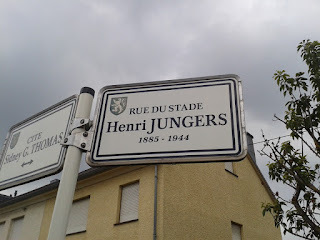 Apart from winning the Coupe de Luxembourg in 1955, the club endured a miserable period, culminating in a long period of third-level football and fended off a merger with near-neighbours Jeunesse. Fola didn't win another major honour until 2013, when they won their sixth league championship, and followed this up with a seventh title in 2015. They had quite a successful Europa League run this season, reaching the third round for the first time in their history before being eliminated by Swedish club IFK Östersund. 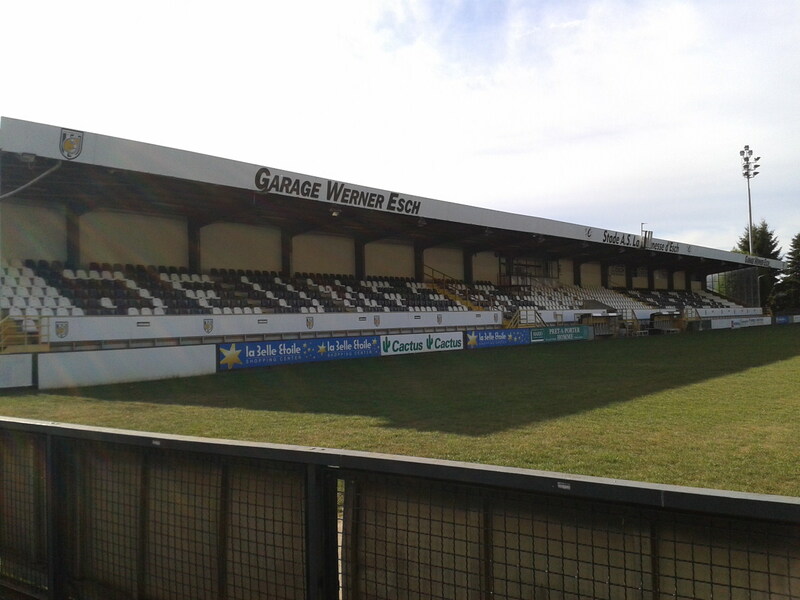 They also opened a small uncovered stand at the far side of the pitch, directly opposite their main stand, ahead of the campaign. Jeunesse, or, to give the club's official name, Association Sportive La Jeunesse d'Esch, were founded in August 1907 as Jeunesse Frontière d'Esch and are Luxembourg's most successful club. They moved to their current ground, the Stade de la Frontière (or Stadion Op Der Grenz in Luxembourgish), in 1920, which is situated in Hiehl, a suburb of Esch-sur-Alzette to the south of town and just a few hundred metres from the French border - hence the name. 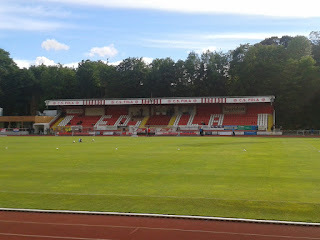 The stadium (pictured above) has terracing on one side and a 1200-seater stand on the other, and is surrounded by terraced housing on all sides; your traditional nieghbourhood football ground, in other words. 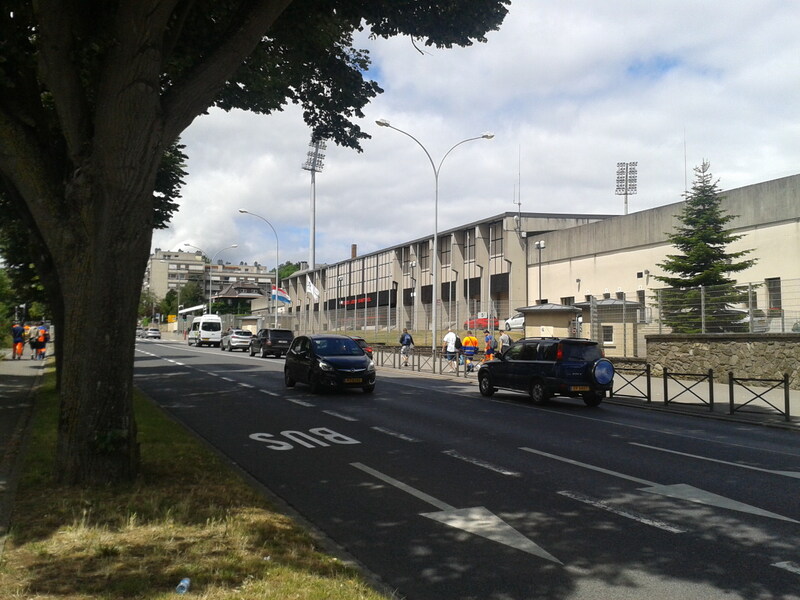 The Stade le la Frontière, home to a club which has won twenty-eight league titles and thirteen Coupes de Luxembourg, is surely a must-see for groundhoppers everywhere. One ground which will shortly no longer be on any groundhopper's hit-list is the Stade Henri Jungers in Differdange. 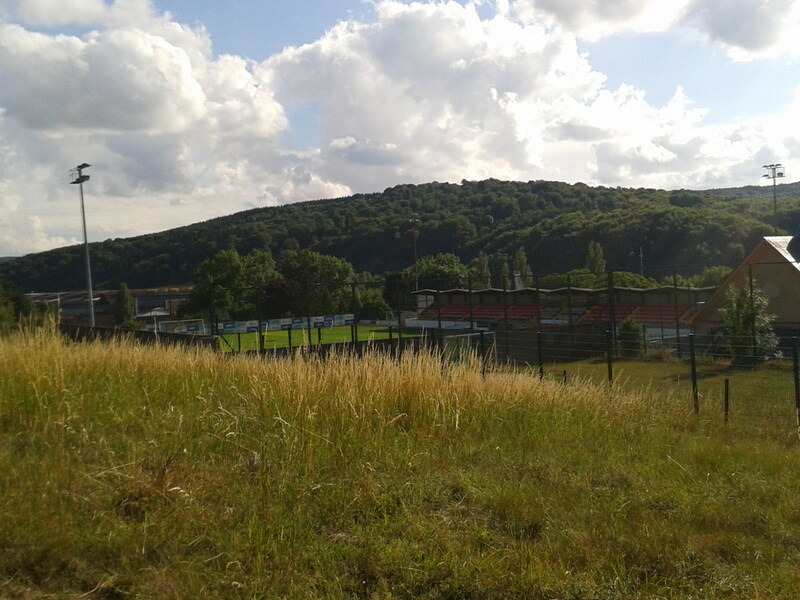 The ground, based in the town's Fousbann district, was home to AS Differdange before the club's merger with Red Boys Differdange in 2003 which created FC03 Differdange. 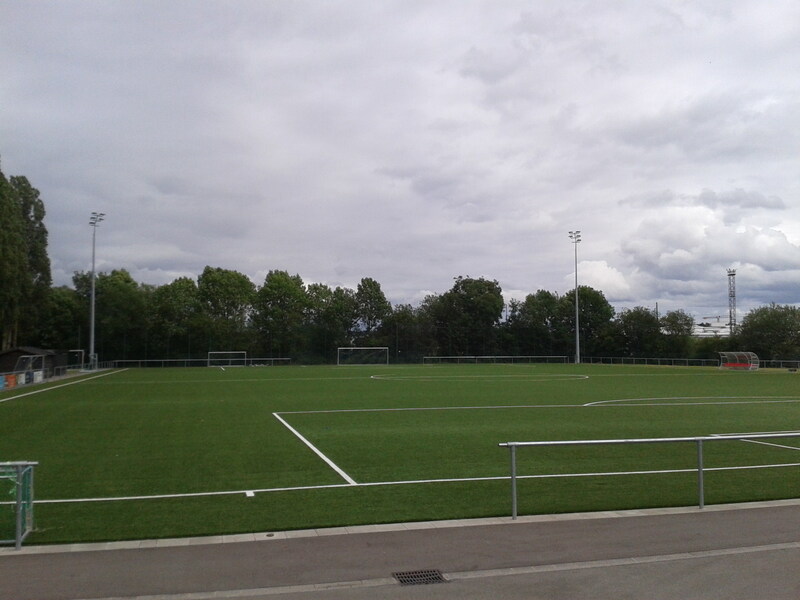 It was used by FC03's youth team until 2012, when the new Stade Municipal opened. The site is being redeveloped, and there was very little of the stadium left to see at the end of June, with just the ticket booths and the old stand still intact (see above). 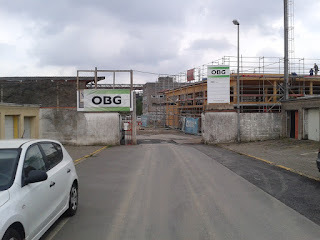 That will change, of course; a small park, youth centre, playground and a by-pass are currently being built and the project should be completed by the end of this year. 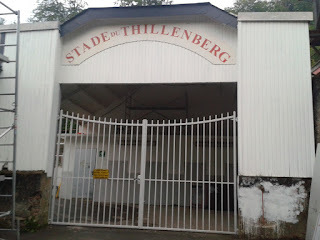 One ground which is still being used in Differdange is the Stade Thillenberg, the former home of Red Boys, which is situated at the town's western extremity. FC03 Differdange's youth teams currently use the ground - which has achieved something of an iconic status among groundhoppers - as did FC03's first team until the Stade Municipal was completed in 2012. 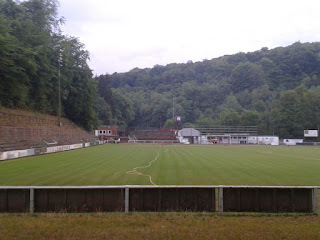 The ground dates from around 1921, and it was apparently built by local miners in their spare time. 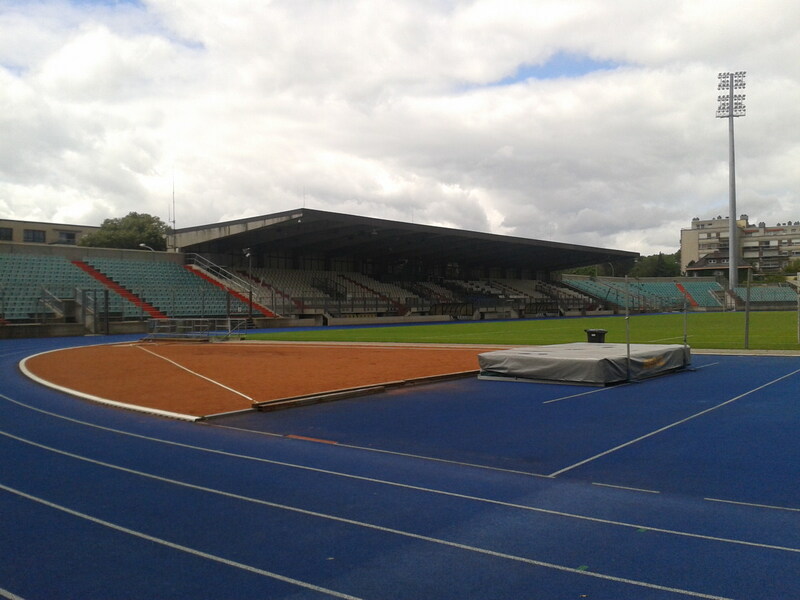 At one time, it was the largest stadium in Luxembourg and hosted a number of international matches up to the outbreak of the Second World War. Fast forward to 2012, and the Differdange town council had originally earmarked the Stade Thillenberg for demolition, with a regional athletics stadium or tennis courts being built on the site. 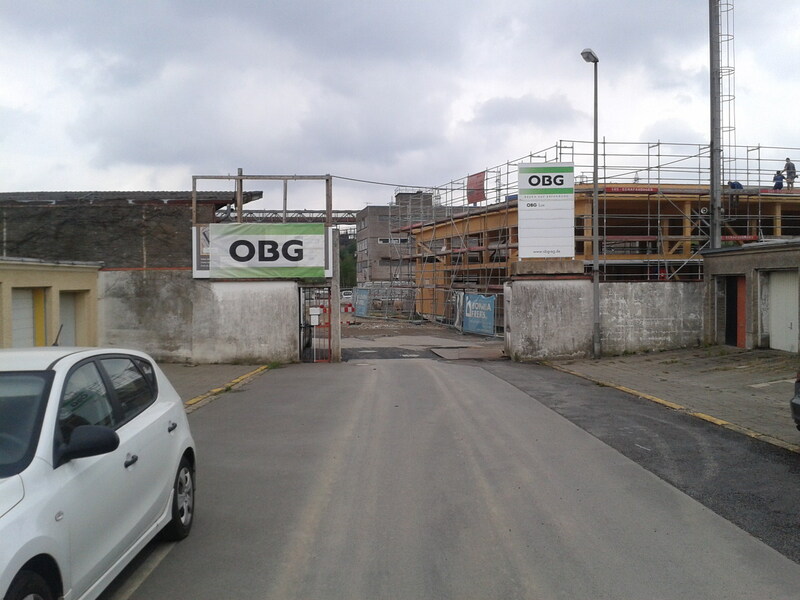 However, they had not reached agreement with the site's owners, Arcelor Mittal, and the matter remains unresolved. 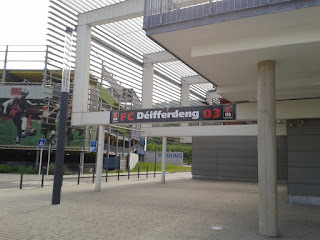 FC03's new ground, the Stade Municipal (officially called the Stade Municipal de la Ville de Differdange), is within easy reach of Differdange's train station and Differdange town centre, but is actually in neighbouring Oberkorn. It replaced the Stade Thillenberg as the club's home base upon its completion in 2012. 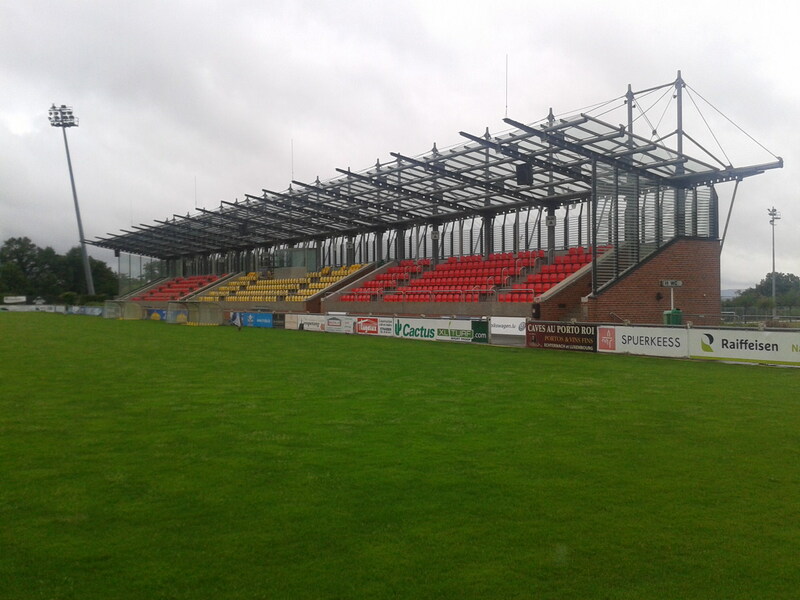 The ground has a capacity of 2400 spectators, and possesses a stand which can hold 1800. 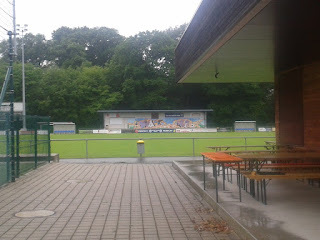 There is a small seating area opposite the stand, which borders the club's training pitch. The stadium forms part of the Parc des Sports complex, which, like the Stade Municipal, is council-owned. 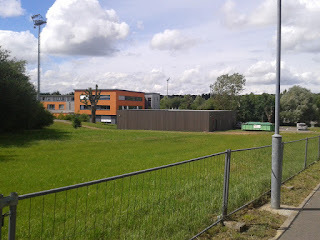 Apart from FC03, the complex is also used by local boxing, martial arts and handball clubs. 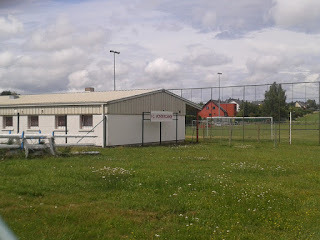 Strangely enough, the handball club is none other than Red Boys Differdange, which was founded in 1939 as part of the original Red Boys' athletics section and used to train at the Stade Thillenberg. Also based in Oberkorn, but at the southernmost point of the village, is the Stade Jaminet (above), home of Luna Oberkorn, a club which was founded in 1932 but which has spent most of its existence in the lower regions of Luxembourg's football pyramid. 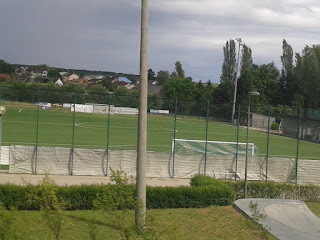 They are taking part in this season's Division 2 (fourth level) along with CS Oberkorn, founded in 1930, who share the Stade Municipal with FC03. 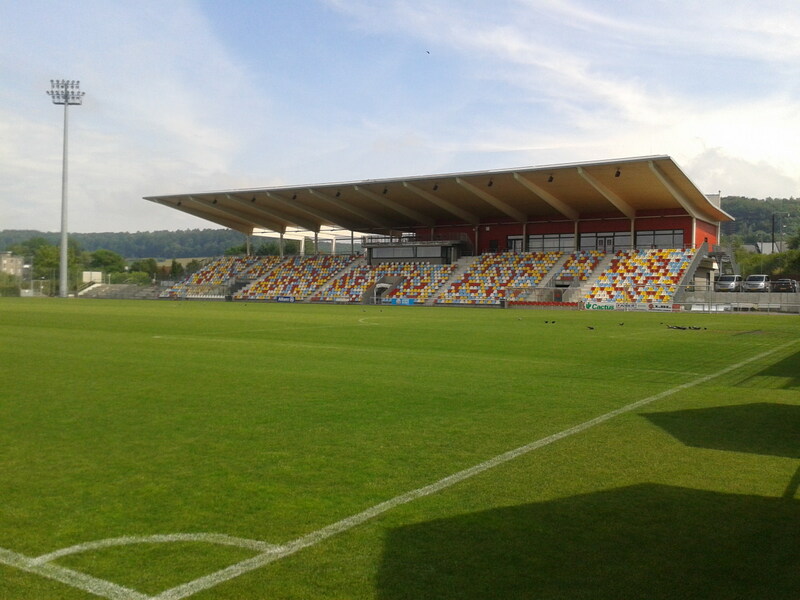 To the north of Differdange lies the town of Niederkorn, home of Progrès Niederkorn; yes, the same Progrès Niederkorn which knocked Glasgow Rangers out of this season's Europa League before going on to lose to AEL Limassol 3:1 on aggregate, a score which somewhat flattered the Cypriots. 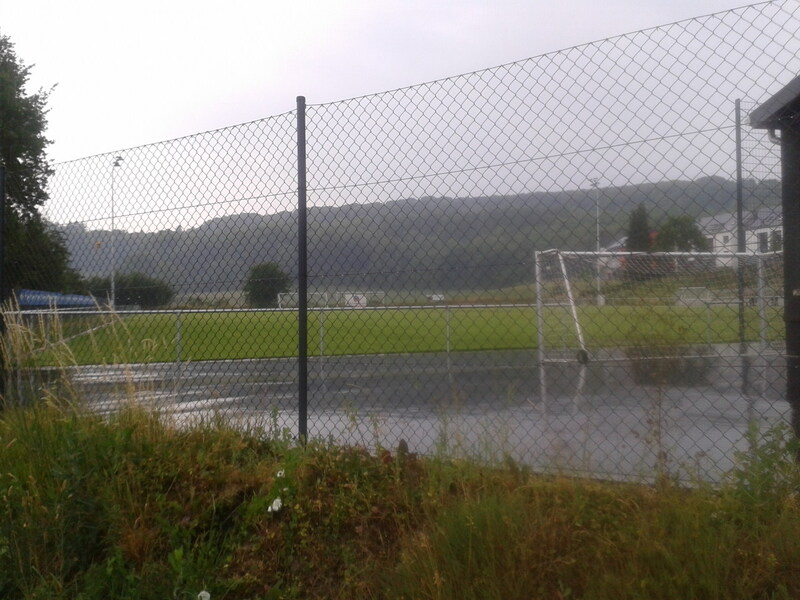 Progrès play their football at the Stade Jos Haupert (see above photos), at the northernmost edge of town. A couple of miles to the east of Luxembourg's international airport at Findel lies the tiny village of Munsbach, which lends its name to fourth-level FC Munsbach, who play at the Terrain Munsbach, which is actually found in the even tinier village of Uebersyren, a few metres to the east of the boundary between the two villages (although FC Munsbach's website home page lists the ground as being in Munsbach). 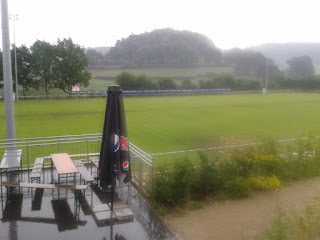 FC Munsbach's ground is the proverbial stone's throw away from the local train-station. 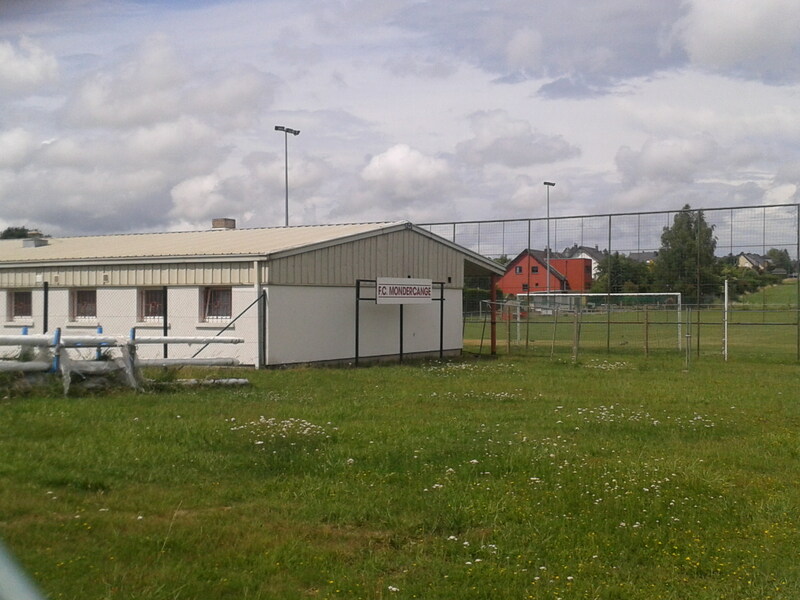 The club was founded in 1946. A few miles to the south of Luxembourg-Ville lies the picturesque village of Itzig, where Blo-Wäiss Itzig play at the Stade Albert Kongs. 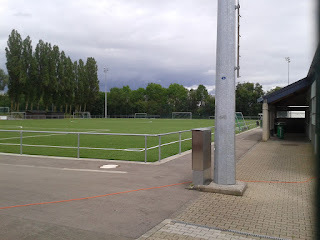 The club currently plays at the fourth-level of Luxembourgish football, having been relegated from the 1. 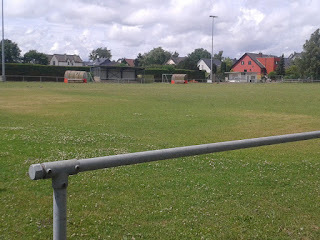 Division at the end of last season. 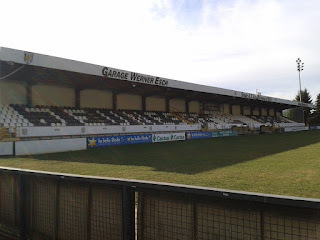 The club was founded in 1941, following on from Excelsior Itzig, which was originally founded in 1919 but had a stop-start existence until it folded in 1928. The ground is named after Albert Kongs, who was FLF president from 1961 until his death in 1968. 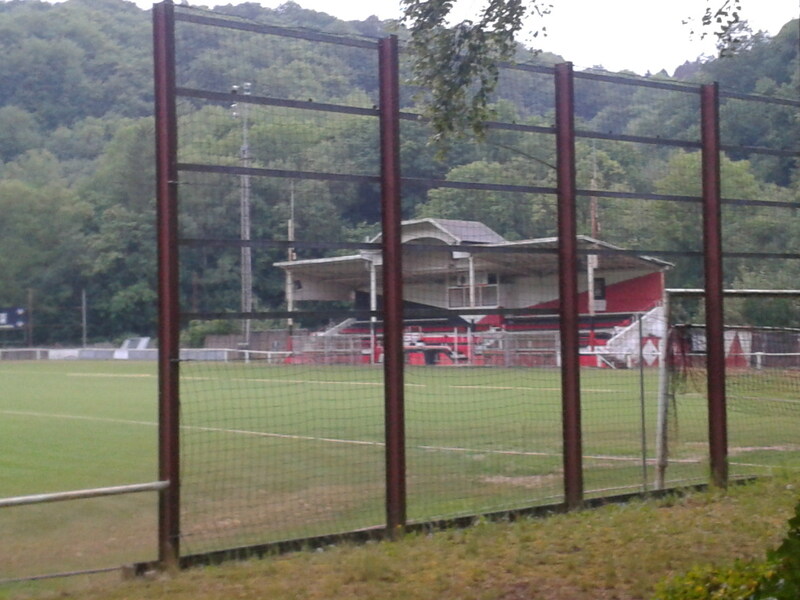 Kongs was one of the founders of Blo-Wäiss, and always maintained that the club was founded as a cover for local Resistance groups during the Nazi occupation of Luxembourg. 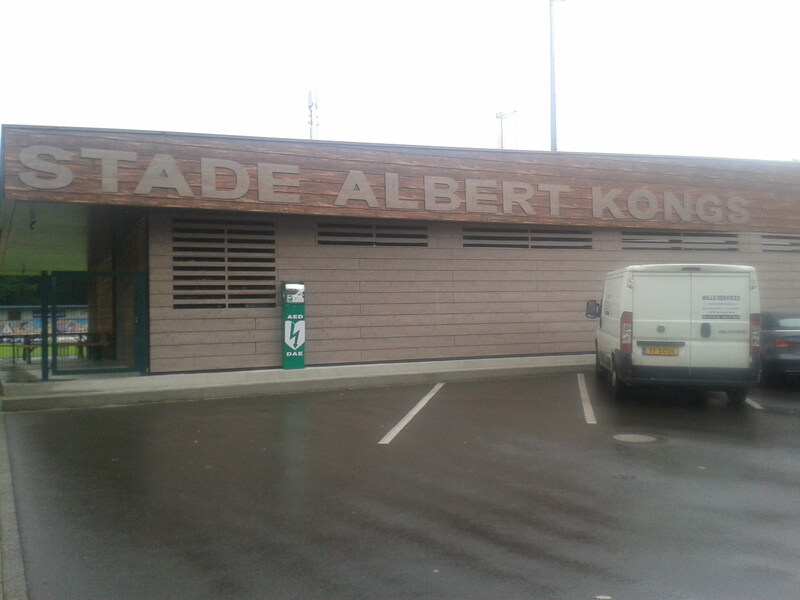 The Stade Albert Kongs was built in 1973, and the new clubhouse was contstructed in 2007. Blo-Wäiss Itzig's ground is around a mile from that of Swift Hesperange, the Stade Alphonse Theis, which is part of the Centre Sportive Holleschberg on the outskirts of Hesperange. Swift will be spending the coming season in the Promotion d'Honneur (second level); the club have yo-yoed between the top two divisions from time to time, and won the Coupe de Luxembourg in 1990. 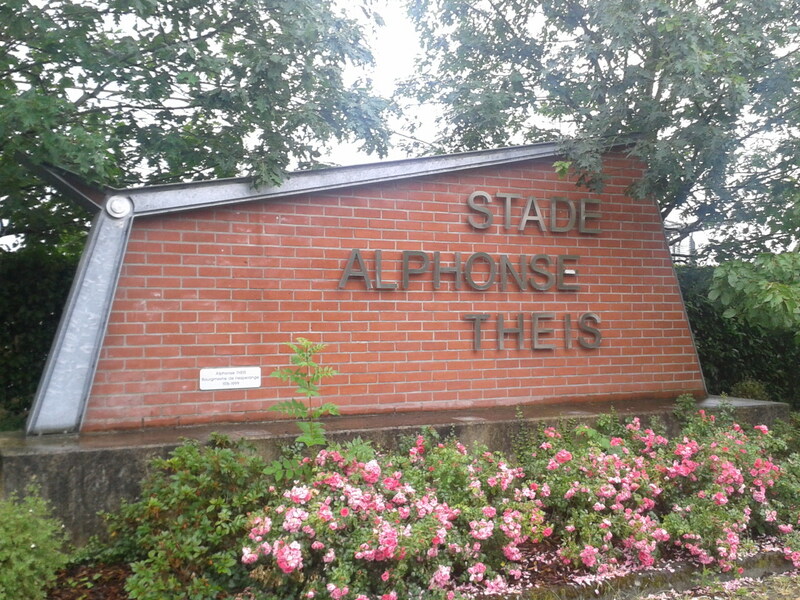 The Stade Alphonse Theis, named after a former Luxembourgish politician, has a capacity of around 4000, and was opened in 2001. 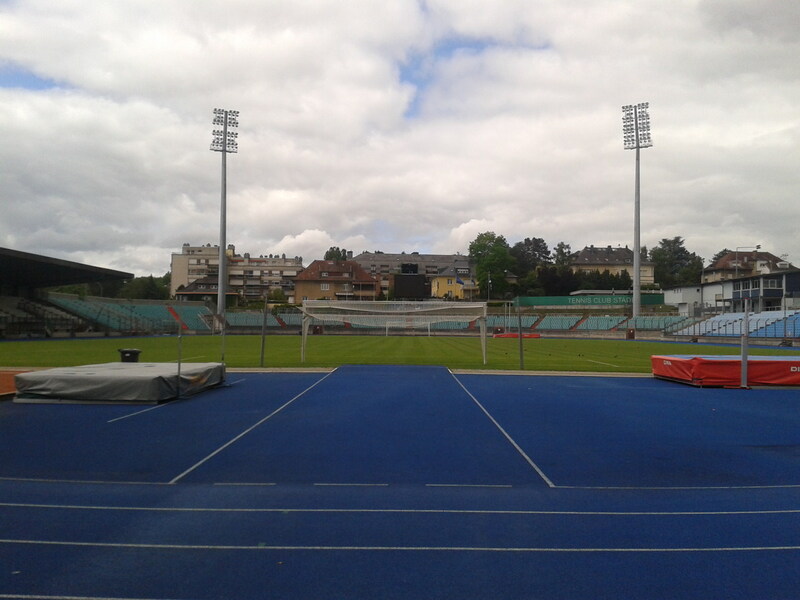 Since it opened, the ground has been the venue for a number of friendly matches involving Luxembourg, the most recent of which took place in March, when they lost 2:0 to Cape Verde. The FLF currently has its headquarters a mile or so outside the small town of Mondercange, and local side FC Mondercange's ground is right beside the FLF complex (the bottom photo of the three above), the Centre de Formation National. The Stade Communal has a capacity of 3300, including a small stand which can seat 254. The club has two other pitches, the Stade Communal II, which is next to the parent ground and is used for reserve and under-age matches, and the Terrain Communal (top two photos), situated next to the village's cemetery on the Rue du Limpach, which is FC Mondercange's training ground. 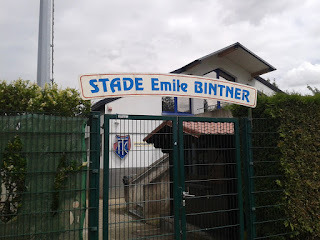 Not far from Luxembourg's train and bus station lies the Stade Émile Bintner, nestled in the middle of the city's Gasperich district and home to fifth-tier Tricolore Gasperich. 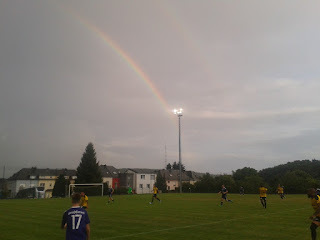 The club was founded in 1919 as Tricolore Muhlenweg, changed its name in 1925 to FC Blue Star Gasperich, and then settled on Tricolore Gasperich three years later. 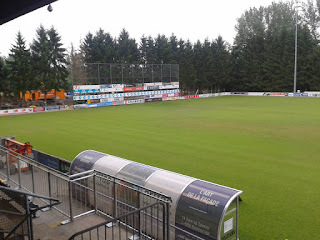 Two years after the club's foundation, it reached the Division Nationale, the top level of football in Luxembourg, but was relegated at the end of the season. 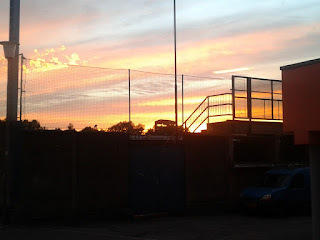 It has never come close to reaching the top flight any time since then, but has spent most of the recent past in the lower divisions, and were relegated to the bottom tier at the end of last season. There could harldy be a bigger contrast between the fortunes of Tricolore Gasperich and F91 Dudelange, formed - as the name suggests - in 1991, after a merger of Dudelange's three football clubs, Stade, US and Alliance. 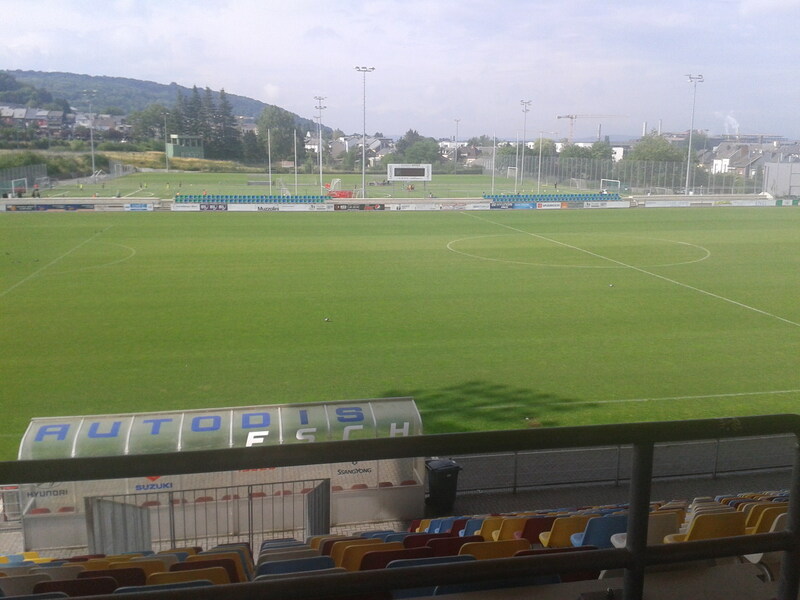 F91 have won 13 national titles and 7 Coupes de Luxembourg since its formation on 26 April 1991. 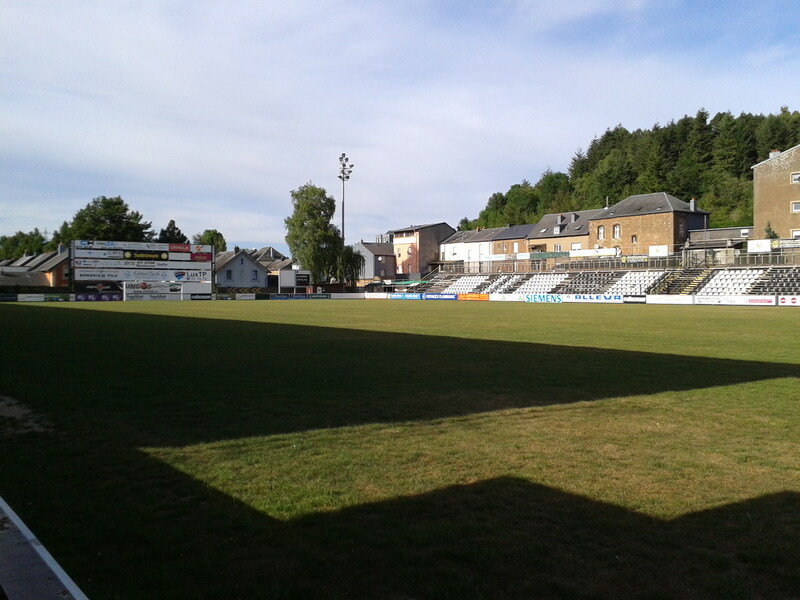 The club plays at the Stade Jos Nosbaum, which was previously home to US Differdange, which was founded in 1912 after - surprise, surprise - a merger between Jeunesse de la Frontière 1908 Dudelange and Minerva Deich. 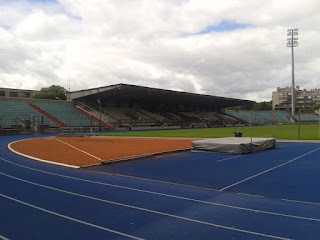 The stadium's capacity is a little over 2500. 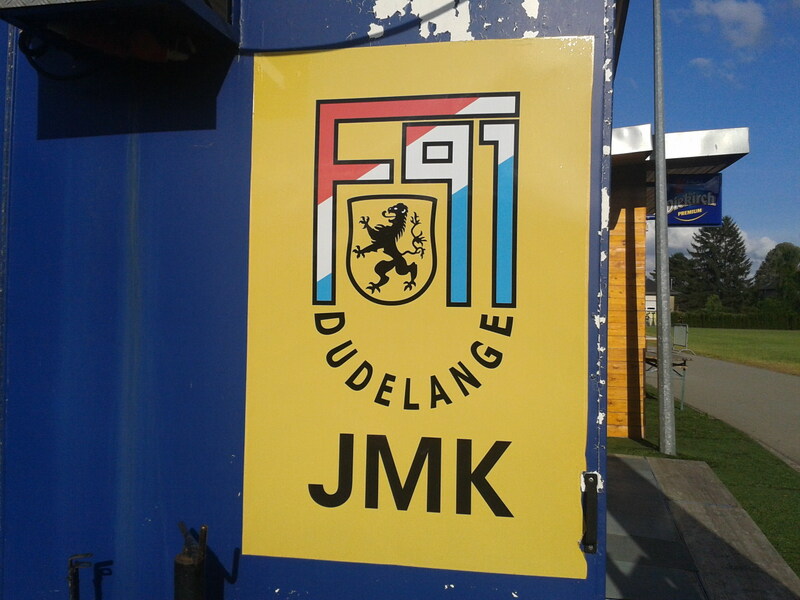 The Cercle Sportif Alliance Dudelange was founded in 1916, also after a merger, between Étoile Rouge and Étoile Bleue. 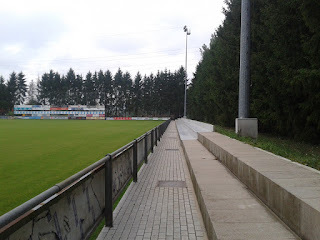 The club played at the Stade Amadeo Barozzi in the town's old Italian Quarter, in the shadow of the giant ARBED steel works, until its absorption into F91. 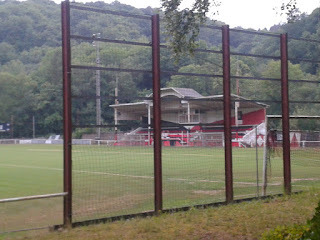 The third club involved in the merger was Stade Dudelange, which was founded as Gallia in 1908. 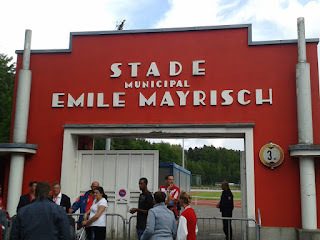 It changed its name to Sparta in 1912, and to Cercle des Sports le Stade in May 1913. 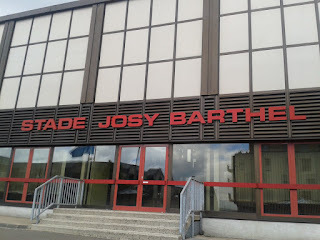 The club was successful in its own right, winning 10 national titles and 4 Coupes de Luxembourg, with the last league championship coming in 1965. Stade played at the Stade Aloyse Meyer, which was little more than a large field containing two football pitches. Little enough has changed, though there now is a third, artificial, pitch on the premises, together with a large pavilion containing meeting-rooms, changing-rooms, a canteen and gym; the Stade Aloyse Meyer is now used by F91 as their training complex. 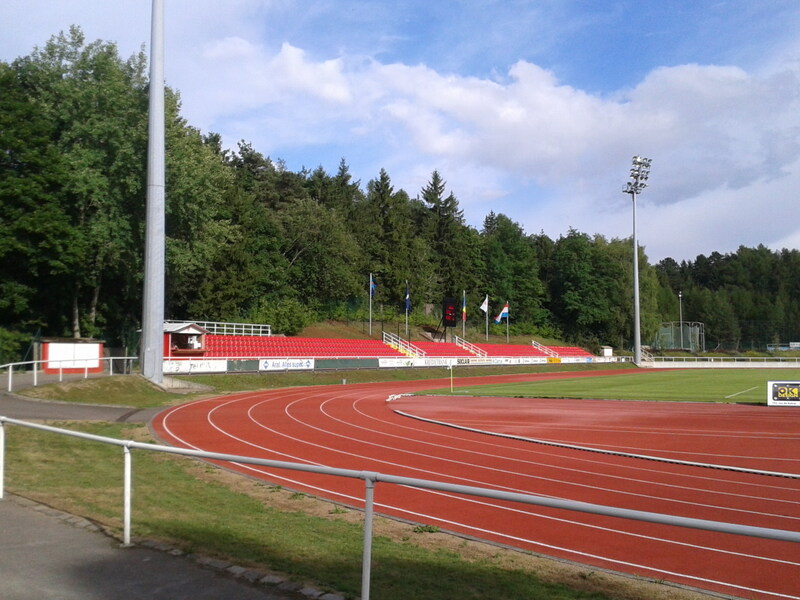 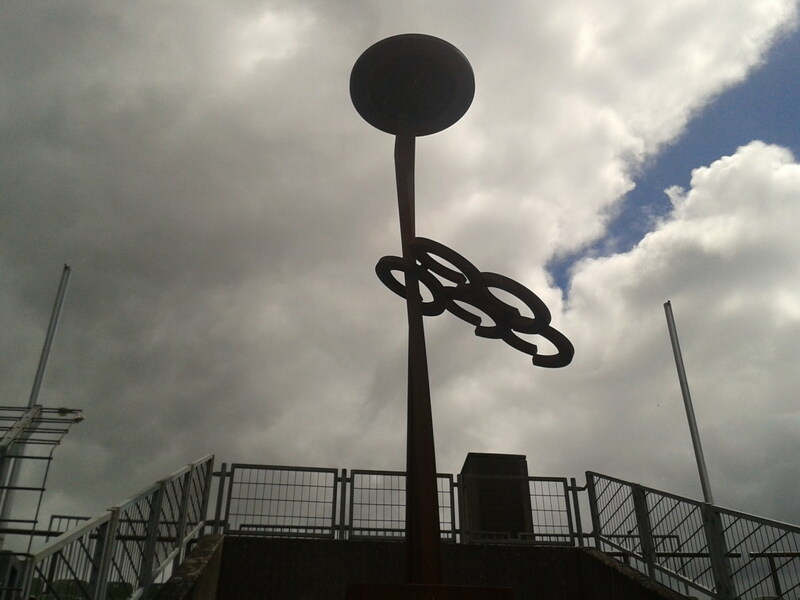 Luxembourg's national side plays its home matches at the Stade Josy Barthel, named after the country's only track and field Olympic gold medal winner, who won the 1500 metre gold medal at the Helsinki Olympics in 1952. 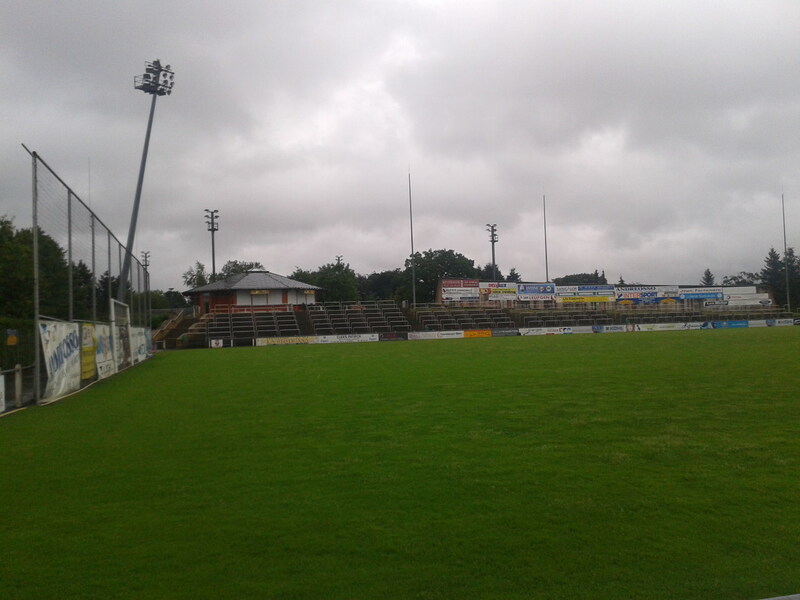 Construction of the stadium commenced in 1928 and was completed three years later with a capacity of 12000. 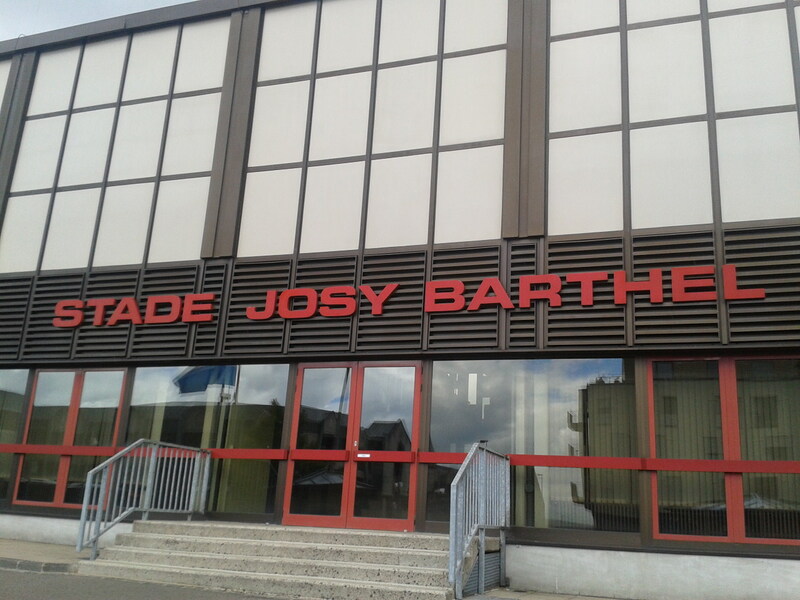 The stadium was called the Stade Municipal from its opening until 1993, when it was renamed the Stade Josy Barthel. It was razed to the ground and completely rebuilt in 1990. The ground now holds some 8000 people. 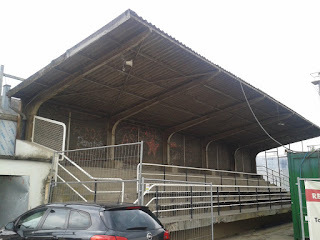 However, there may have been an earlier Stade Municipal in Luxembourg-Ville; the authoritative De Letzebuerger Fussball website lists matches taking place at a Stade Municipal in 1924. 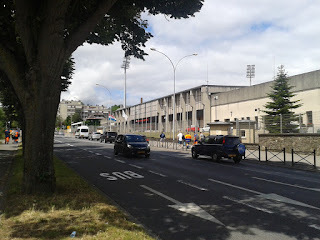 The current Stade Municipal is also used for athletics and rugby, but its days as a sports venue may well be numbered. 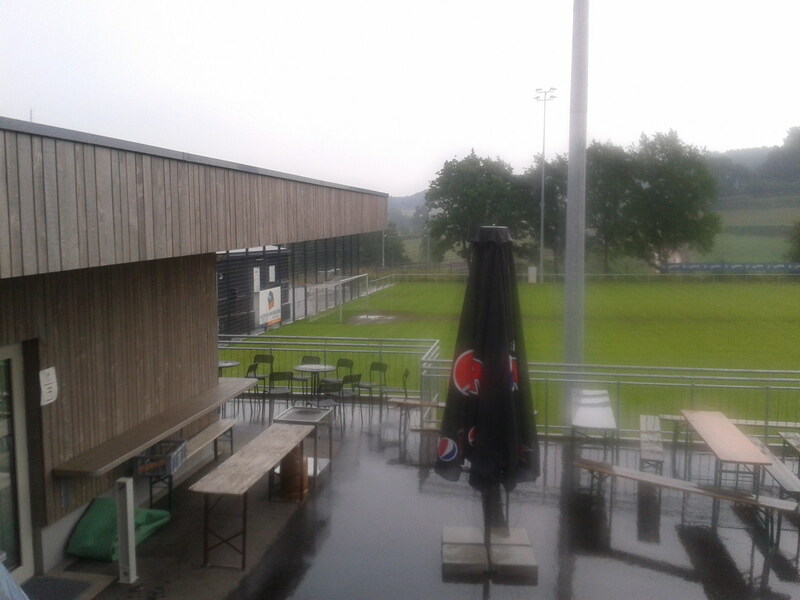 In February 2014, plans were announced for a new national stadium for both the FLF and the Luxembourg rugby federation at Kockelscheuer, to the south of Luxembourg-Ville, which is expected to cost some €64.5 million - almost twice the original budget - and have a capacity of 9595. 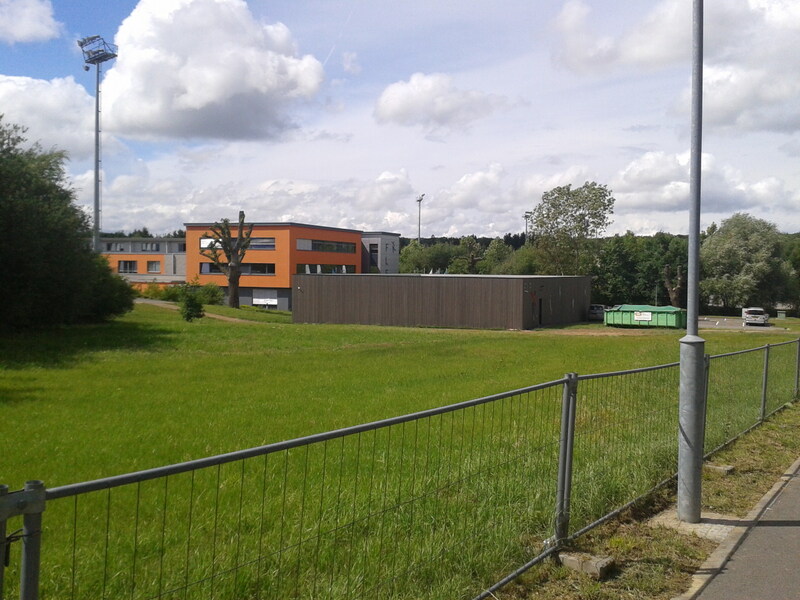 Work has already started on the stadium, which is expected to be completed in late 2018/early 2019. The Stade Municipal, meanwhile, will continue to host international football and rugby matches until then; plans were afoot to renovate the stadium, but with the coming of the stadium at Kockelscheuer, the stadium will be demolished to make way for a housing development. 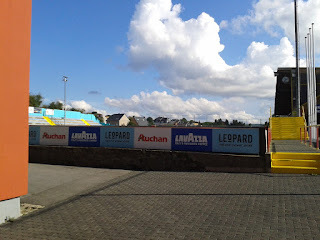 Will the building of the new stadium usher in better times for d'Roud Léiwen and for football in Luxembourg in general? 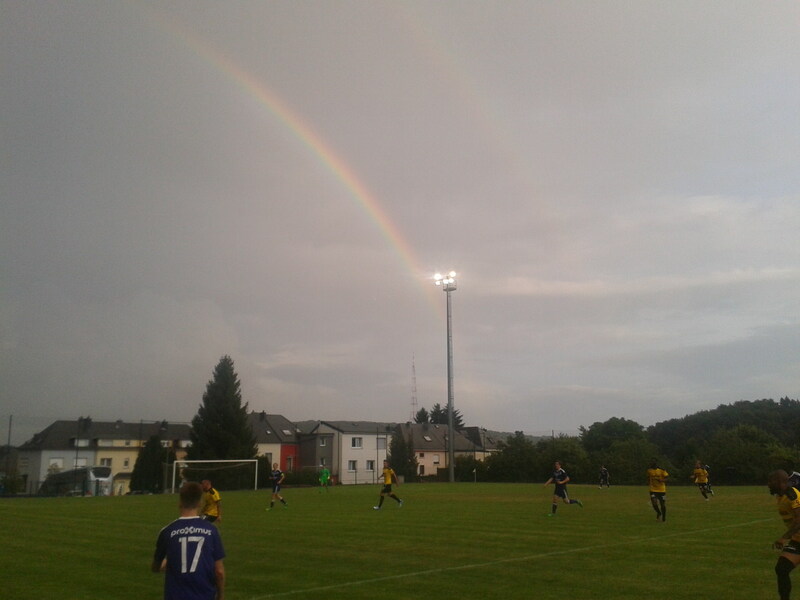 AUTHOR'S NOTE: The above article is part of a series of articles on football in Luxembourg, which will be rolled out over the next few months. 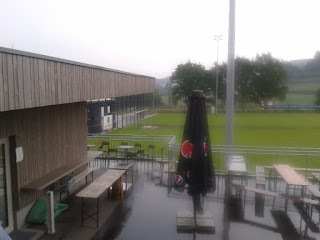 Match reports, interviews and a couple of articles will come together under the #ProjectLuxey umbrella. Numerous other websites were also checked in order to verify information.